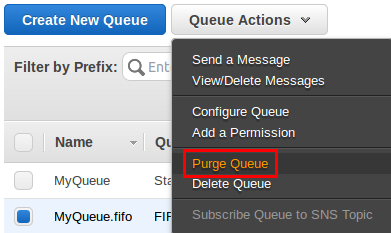 If you don't want to delete an Amazon SQS queue but need to delete all the messages from it, you can purge the queue. In this tutorial you learn how to purge a queue. When you purge a queue, you can't retrieve any messages deleted from it. The message deletion process takes up to 60 seconds. We recommend waiting for 60 seconds regardless of your queue's size. From Queue Actions, select Purge Queue. The Purge Queues dialog box is displayed. All messages are purged from the queue. The Purge Queues confirmation dialog box is displayed.